With protective flooring and wall coverings for Fiat Doblò commercial vehicles, the bodywork of your van’s cargo area will enjoy an extended lifetime. 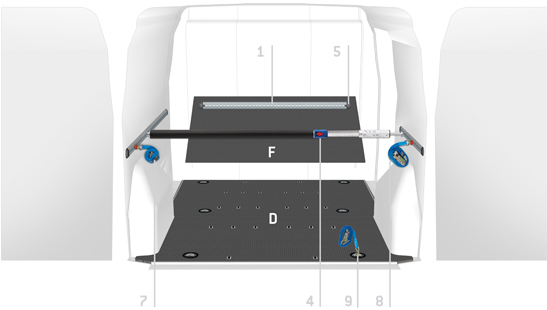 The marine plywood flooring, with its 9 mm thick phenolic film finish designed to fit around the vehicle’s original load anchoring fixtures, covers the van’s protective paintwork, screening it from the scratches and knocks inevitably produced by the equipment and the load. The polypropylene honeycomb panellings for the sides/doors perform the same function. With these protective linings, it is virtually impossible for damp and acids to take hold. Doblò van floorings will not only protect the interior along the sides but also provide a base for fixing the shelving. They can be supplied together with AIRLINE guides and load restraining bars for perfectly safe load securing, in compliance with the directive 2014/47/EU. Contact us for a no-strings, personalised quotation for your Fiat Doblò interior outfitting. Flooring for right side door vehicle with metal sheet sidewalls. Find out about the full range of accessories!